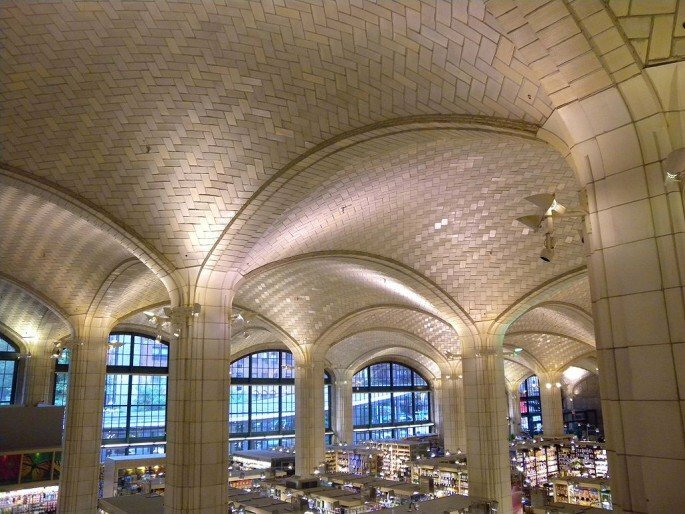 Guastavino tiles–a design technique for thin-tile structural vaulting brought to New York at the end of the 19th century by Spanish architect and builder Rafael Guastavino and his son Rafael Jr.–can be seen at 250 locations throughout the city. Most of these spots have grand public purposes, such as Grand Central, the Cathedral of St. John the Divine, or the Municipal Building. But one locale has gained famed for its very un-grand function as the home of a grocery store. 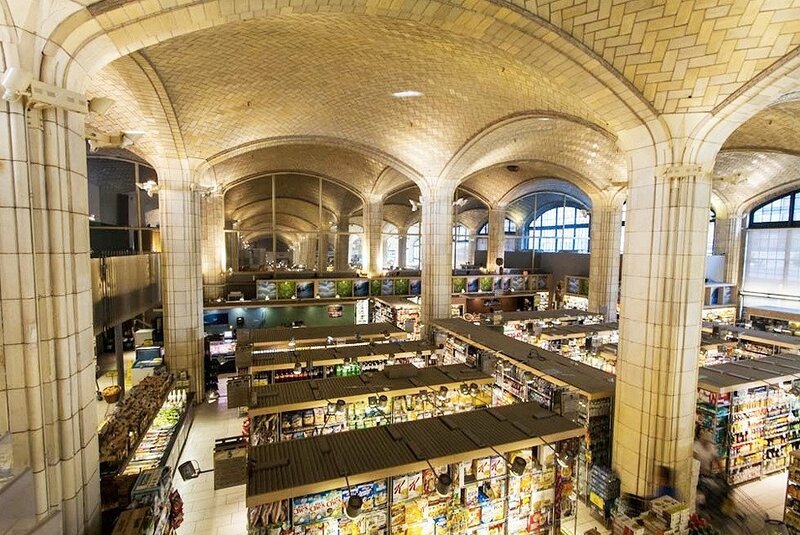 The Food Emporium underneath the Queensboro Bridge has occupied one half of the Guastavino-tiled arcade known as Bridgemarket since 1999. This Saturday at 5:00 p.m., though, it will close its doors for good, according to Bloomberg, which leaves the fate of the historic interior up in the air. Bloomberg now reports that “the Food Emporium’s lease is one of 10 in Manhattan that were designated for auction under parent Great Atlantic & Pacific Tea Co.’s bankruptcy, and it’s the only one that hasn’t found a buyer.” Brokers point to the location as the reason; because of the bridge traffic, it’s not convenient for pedestrians and is more suited to a use like the neighboring event space. The building is city-owned, but is leased to a Las Vegas company of investor Sheldon Gordon. According to him, Bridgemarket has seen interest from design and soft-goods stores, as well as an unnamed supermarket. “We are not going to be putting in a gym or a health club. It’s going to be a more appropriate kind of tenant,” he said. The Queensboro Bridge and the space below it were designated New York City landmarks in 1974, but the Bridgemarket was not designated an interior landmark, meaning internal alterations will not be subject to review by the Landmarks Preservation Commission. The original plan for this space, before Food Emporium, was for a year round green market. The Sutton Place neighborhood voted that down. But now it might be time to re-visit that idea. It might just work. I have been an area resident for over 35 yrs. The Food Emporium seemed to work there but the large co. went under which is no reflection on the profitability of the space. The T.J.Maxx which also occupies the under the Queensbridge space is doing very well. A Trader Joe’s or Target would be ideal. The photos here kind of make the space look bigger than it really is? Those are mirrors on the back wall.